The standard fall back options for cooking a potato are to bake it, mash or french fry it. Any one of the three methods is capable of producing fine results if the motive for its choosing is not because one does not wish to bother thinking of any other possibilities. Somehow, anything prepared in the spirit of disinclination to expend energy or thought over it, tastes of that spirit, too. 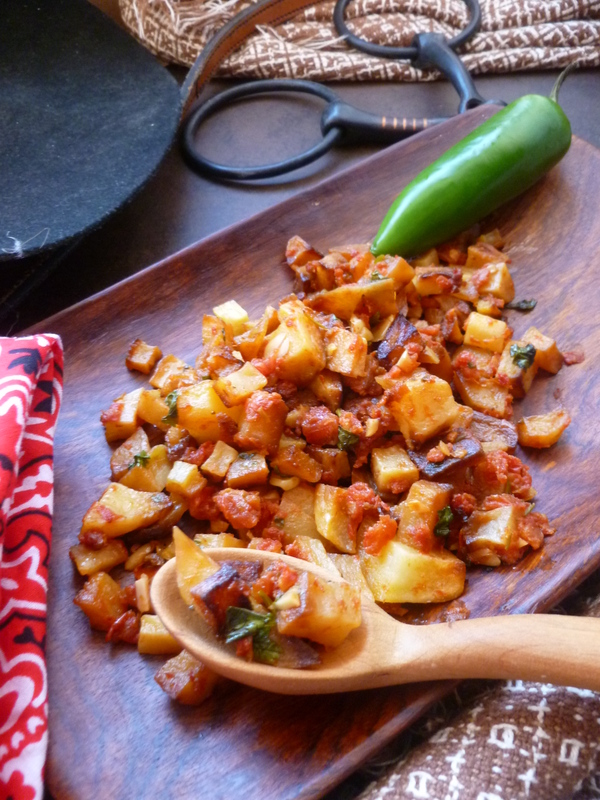 Papas Bravas is a way of cooking the humble potato with flair and without…monotony. The recipe for it concludes the Menu: A July 4th Dinner under the Desert Sky. 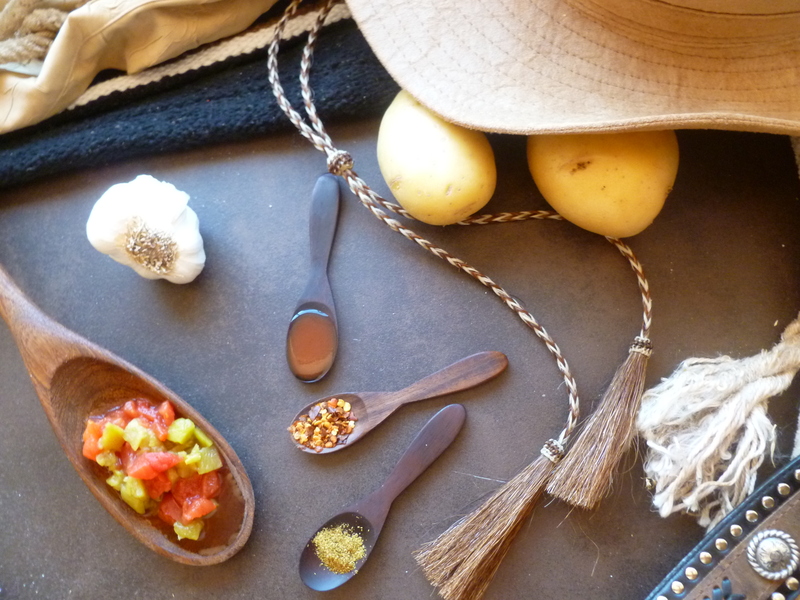 And, it seems a fitting conclusion, bringing together an ingredient originating in the New World with a style of preparation from the Old, specifically… from Spain…a country that has contributed richly to the culture and history of the Americas. 1 and 1/2 pounds of Potatoes: Russets (the large-ish potatoes with the coarse, dark brown peel) are a good choice…but a large, thin-skinned potato (so long as it is not a waxy new potato) such as the Golden Yukon will be fine, too. 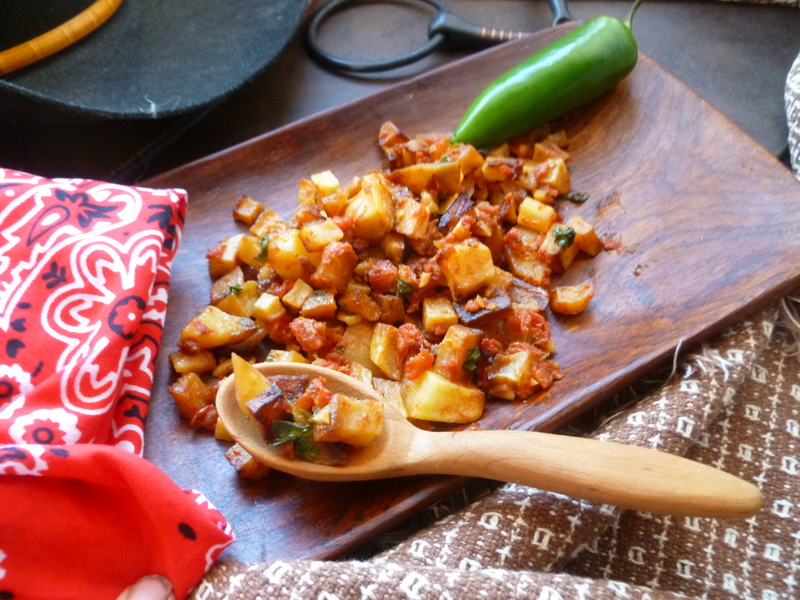 Optional: 3 Tablespoons of canned Roasted Chopped Hatch Green Chiles: The chiles are not traditional to Papas Bravas, but they are a good addition if you happen to have them. 1. Peel the potatoes and cut them into small cubes (about 1/2-inch size). 2. Put the tomatoes, garlic, cumin, sugar, red pepper flakes and Tabasco in the food processor or blender and pulse just until the tomatoes break up—The mixture shouldn’t become a purée. 3. Heat the olive oil in the pan over medium heat until it shimmers. Add the potatoes. (They should fit in the pan in a single layer.) Fry them without turning them, (for, perhaps up to 10 minutes) until they brown well on one side. Then turn them and brown them on the second side. The less they are turned, the more effectively the potatoes brown. 4. Add the tomato mixture and the chopped green chiles (if including them) to the browned potato cubes and stir to coat them. Continue cooking the potatoes over medium heat, stirring frequently, until the potatoes are cooked through and they have begun to absorb the sauce…for, perhaps, 5 minutes or a little more. 5. 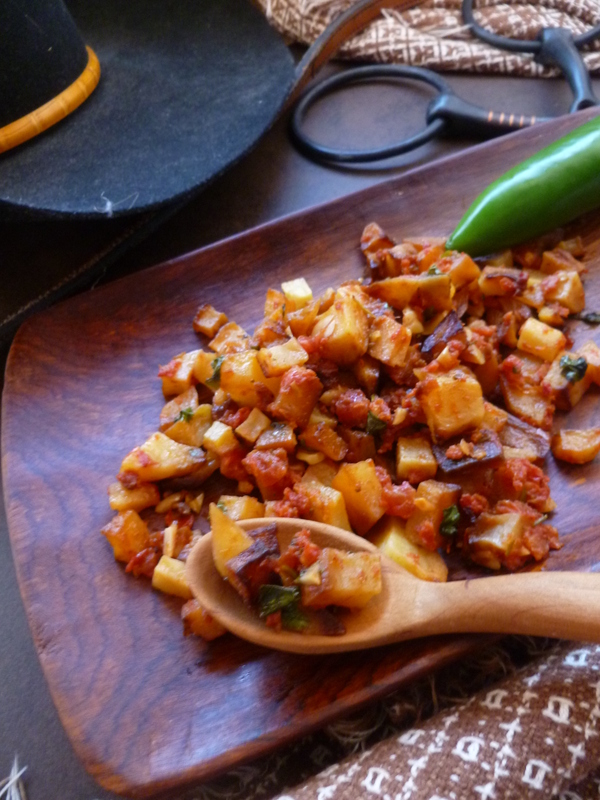 Sprinkle the potatoes with the chopped cilantro and add coarsely ground salt to taste. A Note: Papas Bravas accompanies the Main Course of Grilled Buffalo on Angel Biscuits in the Dinner Menu: A July 4th Dinner under the Desert Sky.